Totally FAB, this little all-valve tone monster offers immense flexibility and has recording amp written all over it. All-valve. Excellent tones. Great for recording. Not a large selection of features. These days, most small practice amps have a list of features as long as your arm: built-in digital effects, amp modelling, programmable presets, maybe even a drum machine and an mp3 input, too. 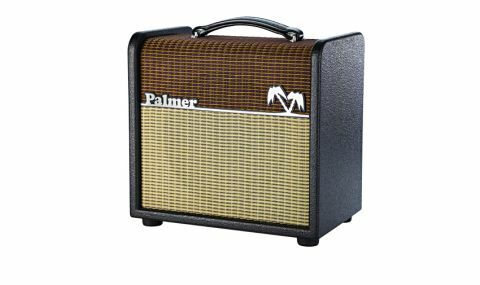 By comparison, Palmer's new FAB5 is almost prehistoric: it has controls for volume, tone and boost level, while the rear panel features a three-way slider switch (labelled Full, Room and Bedroom) that controls a built-in attenuator. That's pretty much it. "What makes the Palmer special is that, unlike most of its competition, this is a pure all-valve amplifier"
What makes the Palmer special, however, is that unlike most of its competition, this is a pure all-valve amplifier, with a single 12AX7 preamp, 6V6 power valve, and most importantly, an EZ81 rectifier. Construction-wise, the FAB5's cabinet is made from MDF with a textured paint finish to the sides and a two-tone grille cloth that wraps over the top. Most of the electronics live inside a robust steel-tray chassis, with the mains inlet and a few other components mounted on a separate back panel. It's all built to a decent standard and looks capable of standing up to a few knocks. One thing that immediately endeared us to this little amp is the boost feature, which is preset to be permanently on. There's a footswitch facility to turn it off if you want, but we reckon the best way to have fun with the Palmer is to turn everything up to 10 and use the rear-panel attenuator to moderate the Eminence Ragin Cajun 10-inch speaker. As you vary your pick attack, or tweak your guitar's volume and tone controls, there's a ton of overdrive and distortion effects, from full-on blazing classic-rock stuff to a very sweet, almost-clean rhythm sound. The FAB5 is not only an excellent practice amp, but it's also a superb recording tool, too, with a great natural compression from the EZ81 rectifier, while the USA-approved sweet treble and smooth bass from the Eminence driver are a great advantage for quick EQ-ing. The lack of front-panel controls isn't a big deal, either; you really play amps like this from the guitar, and the Palmer is very receptive to this way of working, with a warm dynamic response that equally flatters single-coil and humbucking guitars. Yes, the FAB5 may be short on features, but it's no slouch when it comes to tone. With very little work - a couple of SM57s is all it takes - you can get some seriously classy recorded sounds from the front and rear of the cabinet. Add your choice of effects plug-ins, and you could be making hit records with killer recorded guitar tones, all courtesy of this little beauty. Sure, you can spend a lot less on a practice amp, but not a pure valve one. Compared with the rest of the pack, the Palmer FAB5 is real boutique tone on a budget, and we definitely like the sound of that.